2015 Land Rover Range Rover Sport. The second time around with any model often allows reviewers such as yours truly to savor a distinct perspective. That differentiation is only amplified when a larger and more powerful engine is offered. 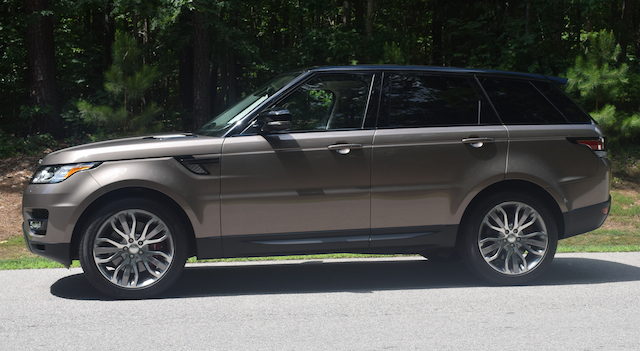 And in the case of the Land Rover Range Rover Sport, the subsequent model came with a 50 percent power boost, due entirely to a 5.0-liter, supercharged V-8 engine. Nevertheless, that’s not to say that the standard 3.0-liter, supercharged V-6 engine falls short. Delivering 340 horsepower and 332 foot-pounds of torque, it is wholly sufficient for this SUV and for the majority of customers too. But whoever declared that sufficiency is the measuring stick of customer satisfaction, especially in the luxury segment? 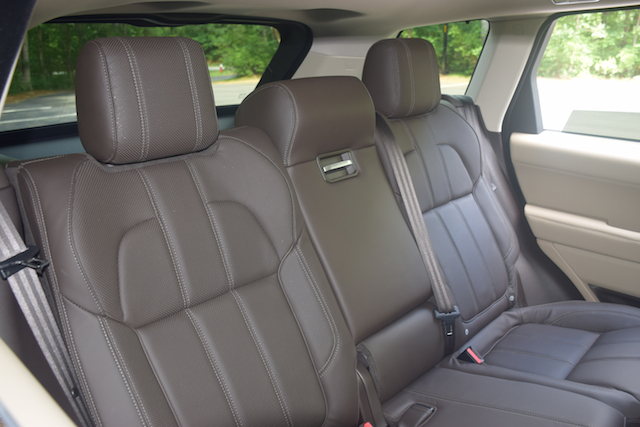 For one group of owners, it is all about the performance with the terrain response system, sliding panoramic roof and cushy, leather interior the bonuses. 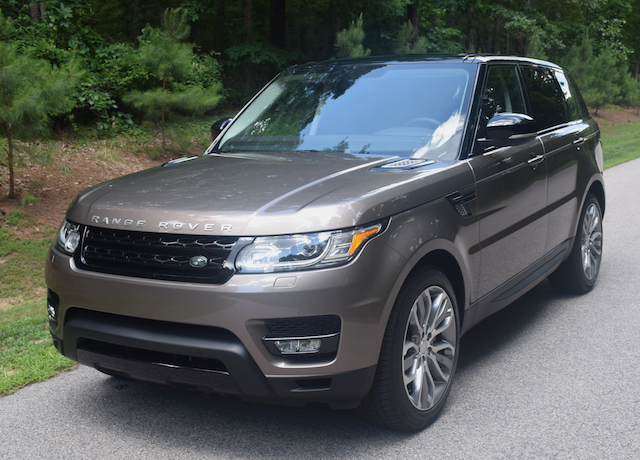 Indeed, you would be pressed to find a more desirable interior than the Range Rover Sport and you also have access to a marvelous terrain management system that takes this SUV where others utility vehicles fear to tread. By reason of having a 5.0-liter, supercharged V-8 engine under the hood, this model’s emphasis is on performance. That’s 510 horsepower and 461 foot-pounds of torque for this midsize luxury utility vehicle, surpassed only by the Porsche Cayenne Turbo S — or so I have been told. Like the Cayenne, the Range Rover Sport has lapped the famed Nurburgring with the SVR edition finishing the renowned 12.9-mile Nordschleife circuit in a cool 8 minutes, 14 seconds according to Auto Express. That’s the fastest time for any production SUV. Incidentally, the SVR edition benefits from powertrain tweaks that squeezes 550 horsepower and 502 foot-pounds of torque from its mass. Take that, all comers! The antecedent model (tested last summer) did more off-road work than the model at hand. This time, two miles of gravelly road and the 4×4 system adjusted to meet those conditions was the extent of my off-roading, if you prefer to call it that. Certainly, when time is of the essence and you already are fully aware of a vehicle’s off-road prowess, you will focus on its on-road capabilities. And capable the Range Rover Sport is. Slip behind the wheel, buckle up, play with the electronic tilt and telescopic steering column, adjust your mirrors and then reach high up on the dash to push start the ignition button and then listen — the engine roars to life and the exhaust system offers its requisite growl in response. The Range Rover Sport is a capable around town vehicle, but its performance attributes can best be measured on the track. Where no track is available, you need only find a stretch of back road to open her up. Fortuitously, I have access to remote roads where neither deer nor the authorities are found. As long as the roads are dry and clear, then I can have at it. Superchargers like turbochargers are forced induction systems. Both systems compress the air entering the engine to provide as much as a 50 percent power boost over comparable naturally aspirated engines. Whereas a turbocharger uses the exhaust stream to provide boost, a supercharger utilizes a belt connected directly to the engine. In particular, superchargers use the crankshaft to supply energy to power for the engine. There are other differences between the two forced induction systems, but for people who place a value on performance, the supercharger kicks in at a lower RPM than a turbocharger, but a turbocharger works best at high speeds. At the same time turbochargers are quieter, while superchargers are easier to maintain. Engage the eight-speed automatic transmission, step on the gas and be prepared to be underwhelmed, at least for a brief moment. Suddenly, the SUV takes off and roars down the road with abandon. On the straightaway, this SUV shines. On any of the twisty roads that you might seek out, its mass and height are evident. This is no Jaguar F-Type that hugs every twist and turn with ease. You’ll feel a slight body roll, but you shouldn’t be afraid to push it. The transmission stays in gear as you plow through the corners and only shifts up as needed. Land Rover employs a double-wishbone suspension with air springs up front and includes active damping and an anti-roll bar. The test model also came with a dynamic response system, what uses the roll bars to fine-tune roll stiffness and roll angle for improved cornering. To the rear is a multi-link suspension with air springs, adaptive damping, an anti-roll bar and the lean control system. 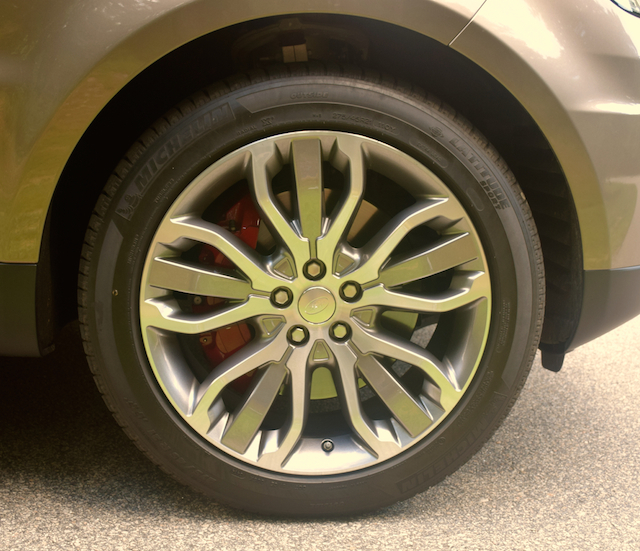 The Dynamic package brings in 21-inch wheels and a Bosch six-piston brake modulator to deliver quicker, smoother and quieter braking. You’ll come to a full stop without much drama and then be ready to take on your next lap. Or you might acquaint yourself with the terrain response system and take this SUV from sand or mud and across rock formations next. If there is an all-around vehicle you desire, there may not be anything superior to the Range Rover Sport. The interior is an attractive package — that is for certain. 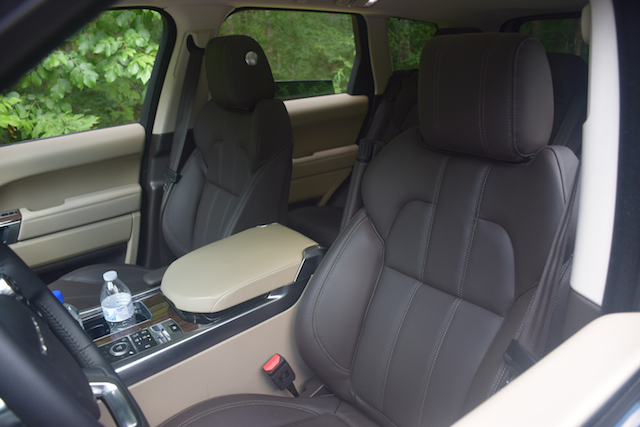 Modern Land Rovers, especially the top-of-the-range Range Rovers have expansive cabins with generous room for five. You can add a third-row kiddie seat for two additional people, but that takes away from the storage area. The interior is polished, elegant, exquisitely crafted and controls are sensibly placed. The driver’s seat is as comfortable as you will find as it offers plush, but firm support. My only gripe was the center display panel as it took some getting used to. But with my oldest son riding shotgun I let him fiddle with the controls. I was certainly pleased when he activated the seat cooling feature, especially on those days when the ambient temperature flirted with the century mark. I always take time to sit in the back seat when a vehicle arrives to confirm its head, shoulder, thigh support and legroom. You won’t have any trouble sitting three across. Moreover, my wife was able to cross her legs — now that’s terrific legroom! Expect to pay handsomely for any Range Rover model. In the Land Rover scheme of things, Range Rover represents its pinnacle series and the Discovery line is for its mainstream models. The Sport SE is the lowest priced model of the five trim levels, coming in at $63,525. The SVR will set you back a handsome $110,475. As tested, the Sport Supercharged comes in the middle, but with nearly $12,000 of options, its final price was $91,272. It is doubtful that if you are shopping for a Range Rover that price is much consideration. If it is, then you need to reset your eyes on the Discovery line. 2015 Land Rover Range Rover Sport photos copyright Auto Trends Magazine.